Yoshihiro Aogami Super/Yasuki Blue Steel Warikomi, Japanese Chef's Knife WA Gyuto(Japanese Style), manufactured by one of the most famous workshop,Yoshihiro Cutlery Mfg.,Ltd. in Sakai/Osaka, Japan. Gyuto style is applicable for multiple objects from Meats to Vegetables.Traditional Octagonal Handle is easy to use for every users. 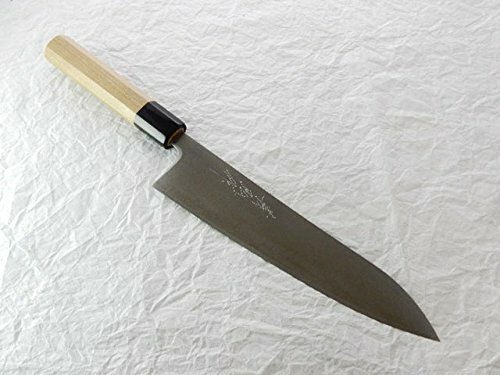 This Professional model is made of Aogami Super(Yasuki Blue Steel) at the core of the blade, squeezed into Stainless Steel(known as "Warikomi method"), with traditional Octagonal Wood Handle.Saya Cover Option is also available for selection. We are pleased to inform you we ship your order directly from Sakai/Osaka all over the World!! !